There are few more critical decisions that business leaders make than how they compensate their sales organization. Unfortunately, many look at this issue from a single vantage point. How much do we want our sellers to earn if they hit quota? While that is an important and relevant question, it should not be the only driver of sales compensation. Unlike any other position in the company, the sales person has two job descriptions, the one called a job description and the compensation plan. While HR may have the job description on file, the one that affects the sales person’s activities is the compensation plan. There are multiple considerations for business leaders to review when developing sales compensation plans because the plan doubles as a job description. Since it directs sales behaviors, you need to look at how it impacts the service the client experiences. It also impacts the overall results for the company. Thus, there are three entities to consider when formulating the sales compensation plan: the sales people, the clients, and the company (employer). The equilateral triangle serves as the perfect model when designing sales compensation as it ensures none of those three entities is over/under recognized by the plan. 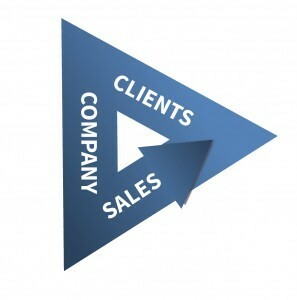 Each side of the triangle represents an entity affected by the sales compensation plan. If any of the sides of the triangle are out of proportion from the others, the result is the law of unintended consequences. Things happen that are not intended, but are consistent with the message communicated by the plan. Here are some examples of compensation plans gone awry. A large health club chain offered a program that provided employees of certain companies discounts on memberships. The way the program was structured was that the health club sales person would generate a lead for the corporate sales person. The corporate sales person would call the company and offer the employees a 20% discount on memberships if they would post a flyer for 30 days to communicate the offer to the employees. Coming back to the equilateral triangle model for sales compensation, this program was a colossal failure. The company paid full commissions to both the health club sales person and the corporate sales person on a 20% discounted membership. Needless to say, the sales people were happy and invested countless hours pushing this program instead of the other programs offered by the company. The other two entities were much less satisfied with this offer. The company, because the membership was heavily discounted and were paying double commissions (not only to the sales people, but their leaders), came to realize that they had a near non existent margin on every sale made. They also found that their corporate sales team dedicated all of their selling time to this program instead of other programs that were of higher margin to the company, but paid lower commission rates. When looking at the third side of the equilateral triangle, the clients saw no value on the program. The companies simply stuck a flyer on a bulletin board and saw no tangible benefits. Further, when those employees who joined the health club through this program were interviewed, most said that they were planning to join any way at list price. Thus, the program failed two of the sides of the sales compensation equilateral triangle model. A firm offering outsourced services to Human Resources Departments of large companies structured their compensation plan to pay commissions to their sellers at the highest percentage for the first 18-months following the commencement of the contract. After that period, the commission rate dropped to a fraction of a percentage. While at the surface the plan does not look perilous, there were some underlying components that caused issues. The 18-month clock never restarted with a company. This means that if a sales person added other locations or regions, they only received the commission rate commensurate with the moment in time of the client lifecycle. If the sales person added a new client location in month 19, the commission they were paid wasn’t enough to buy a cup of coffee at Starbuck’s. If the client purchased additional services, the same compensation issue occurred. The plan told the sales person to sell whatever you could in the first contract and not to bother with upselling/cross-selling as the compensation level did not justify the work. The clients suffered as a result of this program as well. Since the commission rate for the sales person dropped after month 18, they noticed that the attentiveness of their sales person dropped too. The plan unintentionally directed that to happen, yet attentiveness of the sales person is critical as the nature of these buying relationships is such that there are hourly transactions. They need their sales person to remain engaged. The HRO provider wasn’t happy either. They came to realize that their sales people were not focused on conquering accounts. The sales person would sell once and move on to some other opportunity. The sales people were not focused on adding locations or on selling new products/services to the account. They also found they would lose many of their clients in year 2 and 3 as the attentiveness of the sales person had dropped. Unlike in the health club example where the sales people were happy with the plan, but the clients and company were not, no one was happy with this plan. After two painful years, the plan was scrapped in favor of one that met the criteria of the equilateral triangle model. Thus as you develop your compensation plan, ask yourself the following questions to ensure you are following the equilateral triangle model. What message does the plan convey to the sales person about where to focus their selling time? How does the plan impact the client experience? If the sales person follows the plan exactly as it is written, how is the company impacted? Remember, the compensation plan you put in the hands of the sales organization are their marching orders. The equilateral triangle model helps to ensure every action taken by your sales team is intended and aligned with your business objectives. © 2014 by Lee B. Salz. Lee B. Salz is a leading sales management strategist specializing in helping companies build scalable, high-performance sales organizations through hiring the right salespeople,>effectively onboarding them, and aligning their sales activities with business objectives through process, metrics and compensation. He is the Founder and CEO of Sales Architects, Business Expert Webinars and The Revenue Accelerator. Lee has authored several books including the award-winning book Soar Despite Your Dodo Sales Manager. He is a results-driven sales management consultantand a passionate, dynamic speaker. Lee can be reached at lsalz@SalesArchitects.net or +1 763-416-4321.